Safari Beach Lodge is focused on preserving the surrounding environment and helping to build the local economy through eco tourism. We believe that tourism can have a positive effect with minimal change to the environment or the local population. 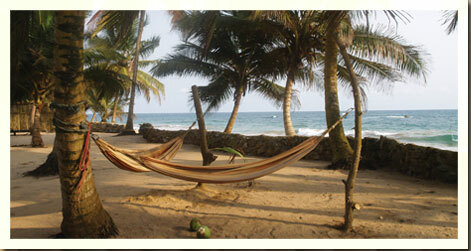 Combining luxury with eco tourism, Safari Beach Lodge is Ghana's only Eco-Luxury resort. The lodge is built in the traditional stick & mud fashion with thatched roofs, this helps the lodge blend in with the environment as well as keeping with local building tradition. The construction and placement of the chalets insures a comfortable cool environment. Each building location was carefully planned so that it would not disturb the existing coconut grove. Our design incorporates local renewable materials and was constructed by the craftsmen in the surrounding villages to the highest possible standard. The chalets furnishings have also been designed and built on site to make each one a truly unique space. We have come up with new and interesting ways to use the materials grown & harvested by the villages. The end result is a perfect mix of modern design and African rustic elegance that we call Eco-Luxury. Electricity for the lodge is provided by generator along with a mix of traditional lanterns and solar powered lamps. The warm, romantic glow of the light brings thoughts of the Safari camps of the past. Our private well supplies fresh water through a gravitational system to the facilities. The odor free toilets are self composting and designed for optimal decomposing.